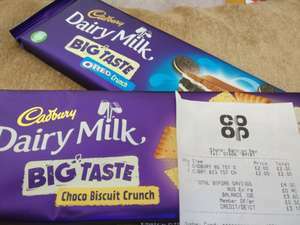 300g of Dairy Milk for £2, + 10% off with NUS card. Varieties: Oreo Crunch & Choco Biscuit Crunch. These were in the reduced section, down from £3.49. Reduction was on an SEL not items individually stickered up, so may apply to all stores with stock. Cadbury's and big taste shouldn't really be in the same sentence since they've changed the recipe. Should be... Cadbury's: Slightly Pukey Taste.